TEMPE, Ariz./TAMPA, Fla. – Leading up to the IRONMAN® Arizona triathlon on November 19, the IRONMAN Foundation® will distribute more than $65,000 to non-profit groups and initiatives, as well as facilitate tribal youth workshops in the greater Tempe and Scottsdale areas. The Salt River Pima-Maricopa Indian Community will host IRONMAN athletes at Salt River High School for student workshops under the theme “The Athlete In You, A Proud Tradition.” SRHS students in grades 7-12 will participate in fitness and nutrition workshops with local IRONMAN athletes from Salt River, as well as IRONMAN athletes from around the world. Students will learn from the experts in athletic preparation, yoga and meditation, as well as healthy eating, including an “athlete fuel” lunch. “We’re excited by the opportunity to not only have our students learn from some of the most dedicated athletes in the world and in our community, but to also have students make the connection that prioritizing health and wellness honors their O’odham and Piipaash heritage,” said SRHS Assistant Principal Rob Barnes. Students at Salt River Elementary School won’t be left out. Continuing the “We’ve Got Your Back(pack)” program launched in April of this year, volunteers at the IRONMAN Foundation booth inside the IRONMAN Village will also prepare backpacks for the elementary students. 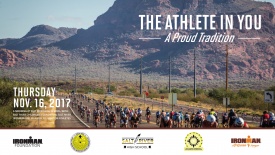 Backpacks provided by Travelway Group International will include school supplies and sunscreen provided by Walmart, water bottles from Gatorade, healthy snacks from Clif Bar and inspirational notes written by IRONMAN athletes competing in IRONMAN Arizona. Additionally, the Salt River Community Children’s Foundation will receive a $10,000 Community Grant from the IRONMAN Foundation. The IRONMAN Foundation Community Fund provides community and volunteerism grant opportunities to non-profit organizations where IRONMAN events are held. This year’s grant funding brings the total giveback to more than $845,000 in the Tempe region. In 2017, The IRONMAN Foundation will distribute more than $1.5 million in grant funding to support the needs of IRONMAN race communities across North America. For more information on IRONMAN and The IRONMAN Foundation, please visit www.ironman.com and www.ironmanfoundation.org. For media related inquiries, please contact press@ironman.com. The IRONMAN Foundation® creates positive, tangible change in IRONMAN race communities by engaging athletes and volunteers to participate in programs that demonstrate service through sport and commitment to community. Since 2003, over $50,000,000 has been provided through IRONMAN Foundation programs to more than 6,300 local, regional, national and global nonprofit initiatives. Through these partnerships, IRONMAN athletes are powerfully linked to the community and together we leave the IRONMAN legacy behind in our race communities long after event day. For more information on IRONMAN Foundation programs, including Team IMF, Community Fund, Your Journey Your Cause, and Women For Tri, visit www.ironmanfoundation.org. The Salt River Pima-Maricopa Indian Community authorized the creation of the Salt River Community Children’s Foundation under its umbrella in February 2003. The Foundation’s fundamental purpose is to promote the health, education, and welfare of its Community youth. Salt River Schools provides cradle-to-career academic and wraparound services to youth and families of the Salt River Pima-Maricopa Indian Community. Along with serving more than 2,000 students in schools outside of the Community, Salt River Schools provides education to more than 900 students at the Early Childhood Education Center, Salt River Elementary School, Salt River High School and the Accelerated Learning Academy. Additionally, Community members seeking job-related and post-secondary education opportunities are served through the Salt River Schools Higher Education department. The purpose of Salt River Schools, in partnership with the community, is to provide EXEMPLARY EDUCATION in a safe learning environment IMMERSED IN THE O’ODHAM and PIIPAASH CULTURES in order for all students to secure a successful future. A Wanda Sports Holdings company, IRONMAN operates a global portfolio of events that includes the IRONMAN® Triathlon Series, the IRONMAN®70.3® Triathlon Series, 5150™ Triathlon Series, the Rock n’ Roll Marathon Series®, Iron Girl®, IRONKIDS®, International Triathlon Union World Triathlon Series races, road cycling events including the UCI Velothon® Series, mountain bike races including the Absa Cape Epic®, premier marathons including the Standard Chartered Singapore Marathon, and other multisport races. IRONMAN’s events, together with all other Wanda Sports Holdings events, provide more than a million participants annually the benefits of endurance sports through the company’s vast offerings. The iconic IRONMAN® Series of events is the largest participation sports platform in the world. Since the inception of the IRONMAN® brand in 1978, athletes have proven that ANYTHING IS POSSIBLE® by crossing finish lines at the world’s most challenging endurance races. Beginning as a single race, IRONMAN has grown to become a global sensation with more than 200 events across 50 countries. For more information, visit www.ironman.com.